This tutorial will show you how to compile C and C++ trackers on Windows systems using CMake build system. It is assumed that you have read the general remarks on tracker structure. This tutorial assumes that you are using Visual Studio 2012 or 2015 for your development and are reasonably familiar with Visual Studio in general. For other build systems and version of Visual Studio you have to compile and install the library before continuing with the second step of this tutorial. Prebuilt binaries are available here. They are compiled using the AppVeyor Continious Integration service. The binaries are compiled for Visual Studio 2012 (32bit and 64bit versions, linked with OpenCV 2.4) and 2015 (64bit version, linked with OpenCV 3.1). Download the appropriate archive and unzip it to the desired location. Then add path to the bin subdirectory of the extracted bundle to the system PATH variable so that you will be able to use client tools and that programs will find the TraX dynamic library. For the purposes of this tutorial we will use a simple NCC tracker that uses OpenCV library (because of this we will also use OpenCV support library to make integration easier and more general). 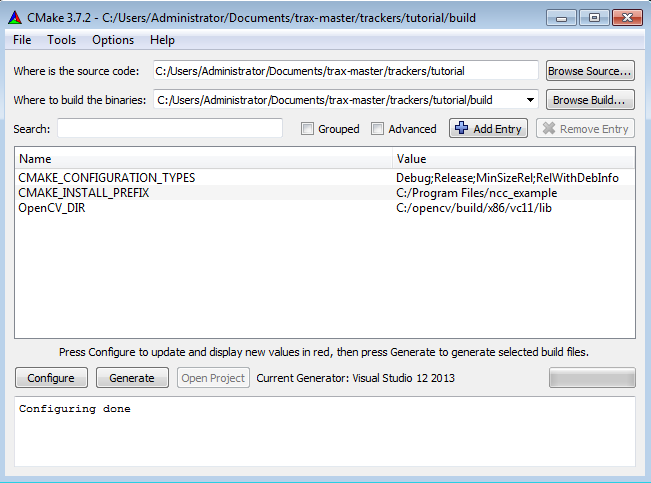 The original source code for the tracker is available in the project repository in directory docstutorialstracker . All the source code of the tracker is contained in a single file called ncc.cpp . The project is compiled as a standard CMake project. 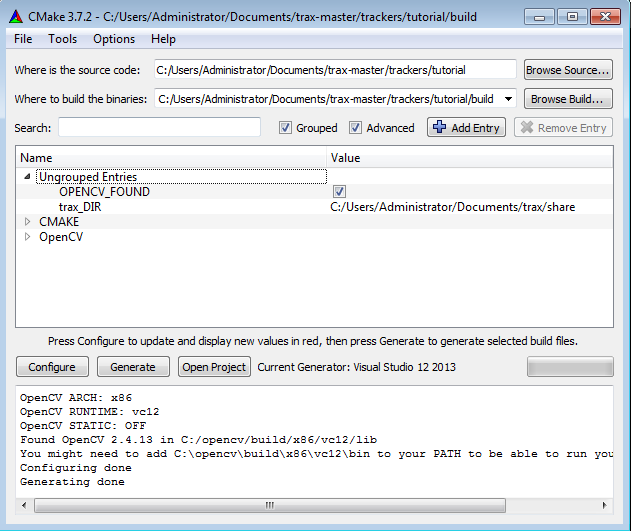 First, we open CMake GUI tool, select the source and build directories as shown in the example below. During the configuration phase we select the appropriate generator. In case CMake is unable to find TraX library automatically we have to set the trax_DIR variable manually (set the variable to the share subdirectory of the local TraX installation root since this is the directory where the CMake configuration files are stored). When there are no more configuration errors we can generate the Visual Studio solution in the build folder open it and compile the project. A successful build results in a binary program (in this tutorial the program is called ncc_tracker.exe and is available in the Debug or Release subdirectory of your build directory). To test if the program correctly supports TraX protocol we can use the client traxtest.exe provided by the client support module of the project. This program tries to run the tracker on a sequence of static images to see if the protocol is correctly supported. Note that this test does not discover all the logical problems of the implementation as they may only occur during very specific conditions; it only tests the basic TraX compliance.